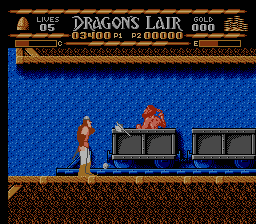 NES Dragon's Lair (JPN) in 03:58.68 by Phil. This game has very smooth animation and the characters, including the last boss (which isn't much seen in this version of the movie), look somewhat funny, despite the theme of the game. The USA version is almost twice as slow as the Japanese version. We recommend reading the author's annotation of this movie.